The Colorado Office of Behavioral Health hired CHI to provide strategic advice on primary prevention of substance use. This page showcases our work. The spotlight is shining on Colorado’s growing problem with drug overdoses. Now community leaders are turning their focus to preventing substance abuse from happening in the first place. Primary prevention is one way to help. It’s a public health approach to help communities avoid substance abuse and many related problems such as depression, violence and teen pregnancy. We know a lot more about primary prevention than we did 30 years ago. The thinking has changed — shifting from scare tactics and required drug testing to strengthening families and communities and reducing risk factors. Colorado has several funders and hundreds of programs working to promote substance use primary prevention. Yet some needs are going unmet, and funders are duplicating other efforts. The Colorado Department of Human Services, Office of Behavioral Health (OBH) is one of the state’s main prevention program funders. OBH hired the Colorado Health Institute to conduct a statewide needs assessment of substance use primary prevention. The goal is to help OBH and other statewide funders better use their resources to strengthen Colorado’s substance use prevention programming. The result is the Statewide Needs Assessment of Primary Prevention for Substance Use (SNAPS). Communities need targeted investments that change the conversation about substance use for youth and their families. Local program administrators — like schools and community organizations — need technical assistance to adopt evidence-based approaches, plus better cooperation among funders. Statewide funders, like OBH, need a systematic way to coordinate existing efforts, reduce overlap and address unfunded needs. CHI undertook a comprehensive study of Colorado’s primary prevention landscape between June and December 2017. 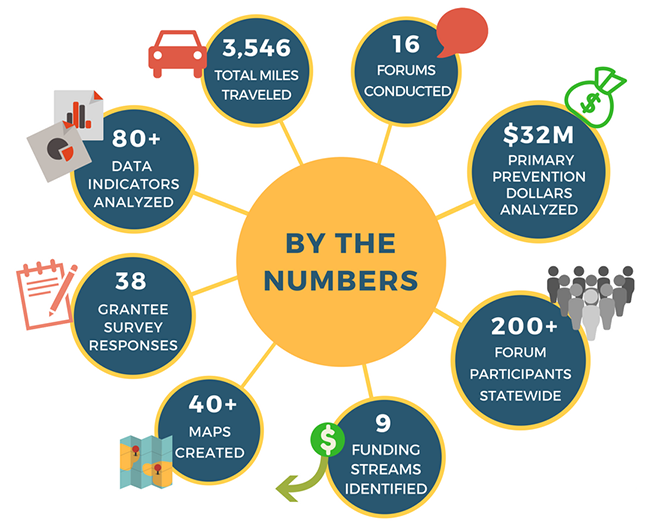 In partnership with OBH, we convened an advisory group of statewide prevention funders and experts, conducted a survey of OBH’s grantees, and analyzed existing prevention efforts. CHI staff convened 16 forums across Colorado to understand community needs and met with more than 200 people, including families, community prevention program administrators and experts. 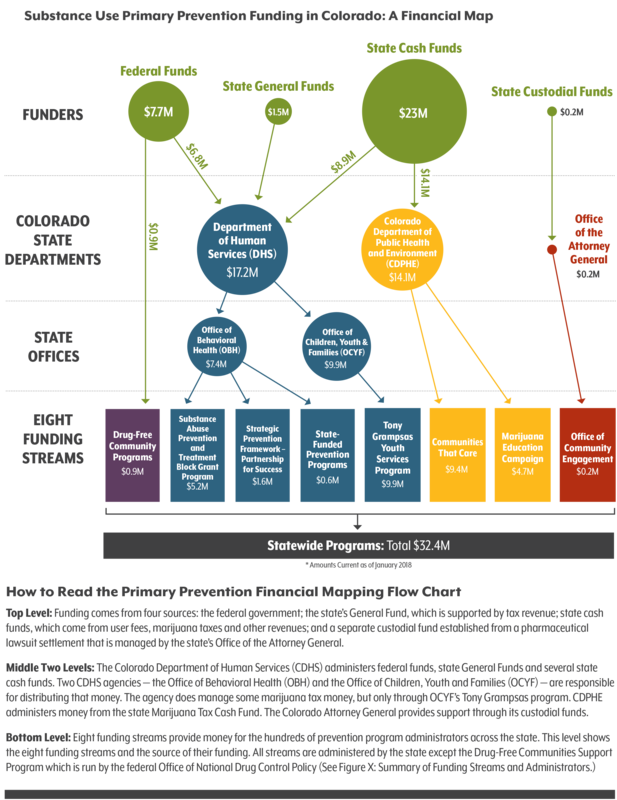 CHI also created a first-of-its-kind financial map to trace the money that funds Colorado’s primary prevention programs. 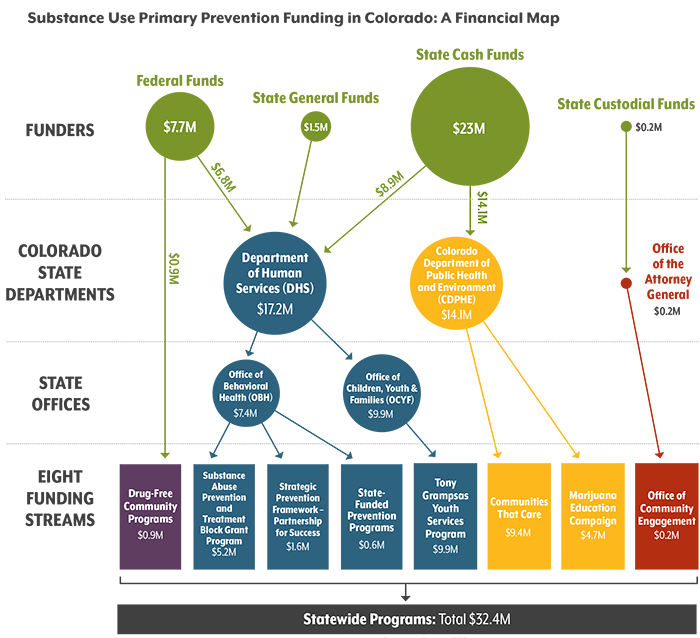 The map traces the path of $32 million from federal and state sources. It can be used to improve coordination among the state’s main prevention funders —OBH; the Office of Children, Youth and Families; the Colorado Department of Public Health and the Environment; and the Colorado Attorney General’s Office. CHI studied the data on several substances — legal or not — as part of our work on this statewide needs assessment. We selected the most relevant data for a graphical look at each substance that we call SNAPShots. These one-page documents are available to anyone. They provide a useful look at in substance use across the state. To learn more about this work, please contact Alex Caldwell at Caldwella@coloradohealthinstitute.org. For other examples of CHI’s consulting work, see our Services page. Alex Caldwell joined the Colorado Health Institute in August 2016. A Director, Alex conducts analysis on emerging health policy issues both in Colorado and nationally.